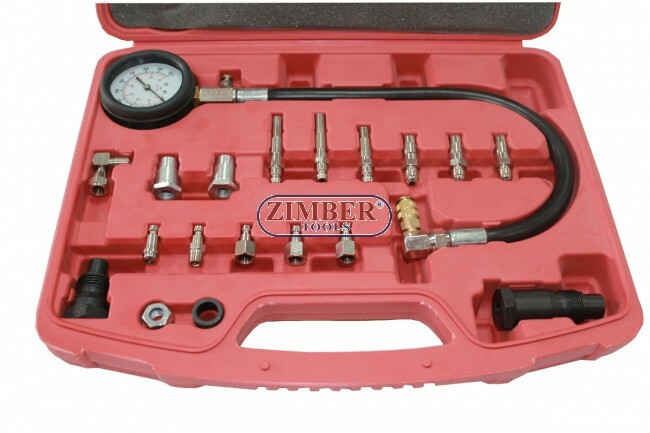 Diesel Compression Tester , ZT-04103 - ZIMBER-TOOLS,20 Piece Diesel Engine Compression Tester .DIESEL ENGINE COMPRESSION TEST KIT. ZT-04103- SMANN TOOLS. DIESEL ENGINE COMPRESSION TEST KIT. ZT-04103- SMANN TOOLS. coupler for easy connection to all adapters. Fittings are as follows (Thread diameters) : 10mm x2(long), 10mm x1(short), 12mm x3. Tests cylinder pressure on Diesel cars & trucks. 3" easy to read red and black gauge records pressure from 0-1,000 PSI and 0-70 bar. Handy deflator for releasing air and automatic re-setting of gauge for repeat testing. Swivel end quickulic hose is 16-1/2" long. 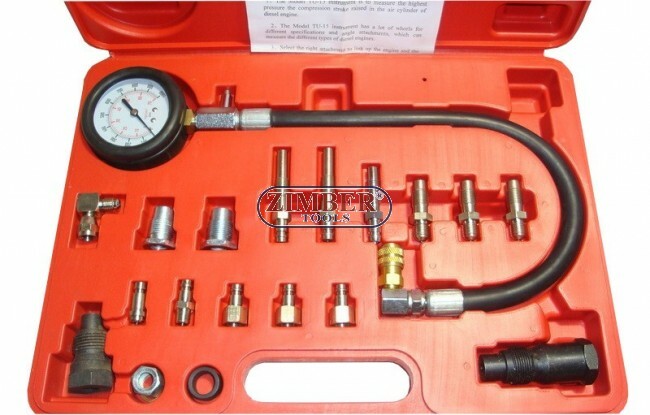 TU-15Cylinder Pressure Meter for Diesel Truck - ZG-A1004. 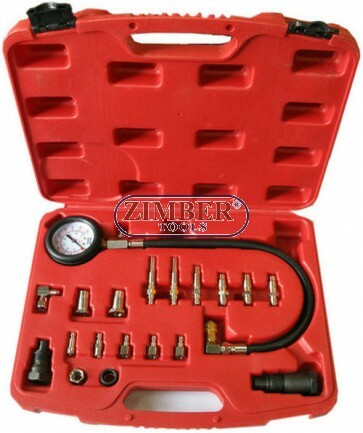 Diesel engine testing tool ZT-04102 - ZIMBER-TOOLS.